"Comb through the text of this decision—you will not find a single commitment made to providing more service in remote communities. Look for any statements made to Wall Street—not one wireless carrier has said that this action will result in a change in its capital expenditures in rural areas." The Order sets application fees at $100 and $270 annual fees for each small cell. Local governments, who have firsthand knowledge of the costs, maintenance, and challenges of hosting industry equipment in the rights-of-way, oppose the FCC decision. Each community is unique and this new policy prevents them from working with mobile carriers to reach the best solution for both parties and the communities they serve. “Local governments share the FCC’s urgency; however, this ruling promises to force local governments to rubber-stamp small cell applications or face crippling legal recourse from providers racing to corner the 5G communications market." 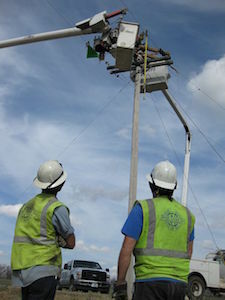 "Without local control, multiple companies could pile many different installations on a single light pole. Imagine a mass of new equipment on a single structure, ruining streetscapes and potentially interfering with first responder, electric utility and other critical equipment."